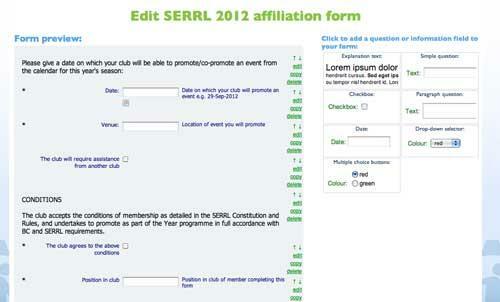 Once your form and affiliation details are set up, you can invite clubs to affiliate using the 'send affiliation invite' button. You can either choose an existing group from RiderHQ, or if the club is not yet on RiderHQ you can enter their details and an email address instead. The club representative will be sent an email with a link that lets them fill in your affiliation form and pay your affiliation fee online. Once they've done that their club will automatically be added to your affiliated groups list, and both you and they will receive an email confirming that this is done. Clubs can also affiliate without the email by clicking the 'Affiliate to...' button on their own group-homepage.